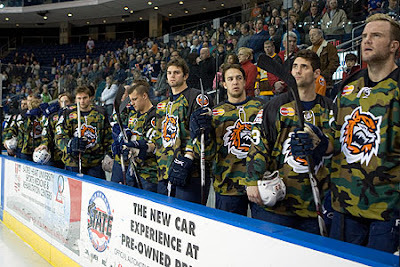 Sound Tigers website: Has the recap of Binghampton's 3-1 win against Bridgeport Sunday. The Sound Tigers have had six roster additions this week. Wednesday, Sound Tigers had Matt Keith, Pierre Luc-Faubert, Brett Pilkington and Jason Pitton made their Sound Tiger debuts this season while Kyle Okposo played in his first professional game on Friday in Binghamton. Luke Fulghum signed a P.T.O. with the Sound Tigers this morning and dressed today for the Sound Tigers. Ct Post: Michael Fornabaio blogged on the game and comments from Jack Capuano on Kyle Okposo's performance. "He had a couple of good chances. We talked a bit about the power play -- he got trapped down low," Capuano said. "It's the first time you saw his time and space taken away. ... Overall, I thought his weekend was good." Okposo took his first big hit, from Matt Carkner early. He said he was having fun out there. Welcome to the American Hockey League, Kyle Okposo. Three games in three days no doubt is something new for him along with a bus ride and back to Binghampton.